Ever since attending one of the bento workshops hosted by Sara from shisodelicious I’ve been obsessed with making these bento boxes. For me they are a fun to prep and I find myself eating more nutritious meals throughout the day. Bento boxes originate from Japan where the homemaker would often prepare a bento for their child, partner or themselves. They are pre made meals that you can buy or make at home to bring to work or school or have whenever you heart desires. 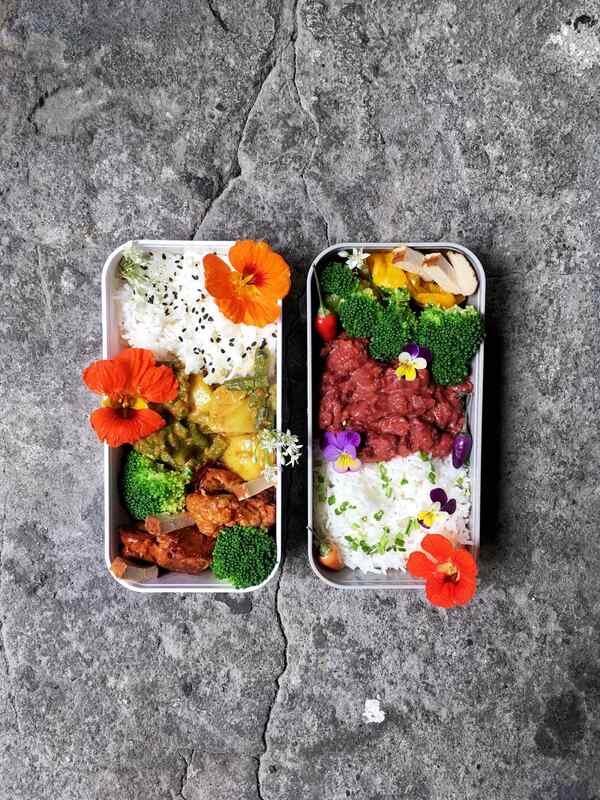 Sara offers amazing workshops where she gives you the basics on bento boxes and I saw she’s even starting to offer a second course in bento making #notsponsoredjustlove. I would definitely join the second edition whenever she comes back to Amsterdam. Not only is she an amazingly kind and creative soul but the workshops are also fun and it’s always nice to meet fellow foodies! So today I’d like to share five of my recent bento’s to give you an idea of what to add to your own boxes or yo give you a basic lunch/dinner or even breakfast idea. 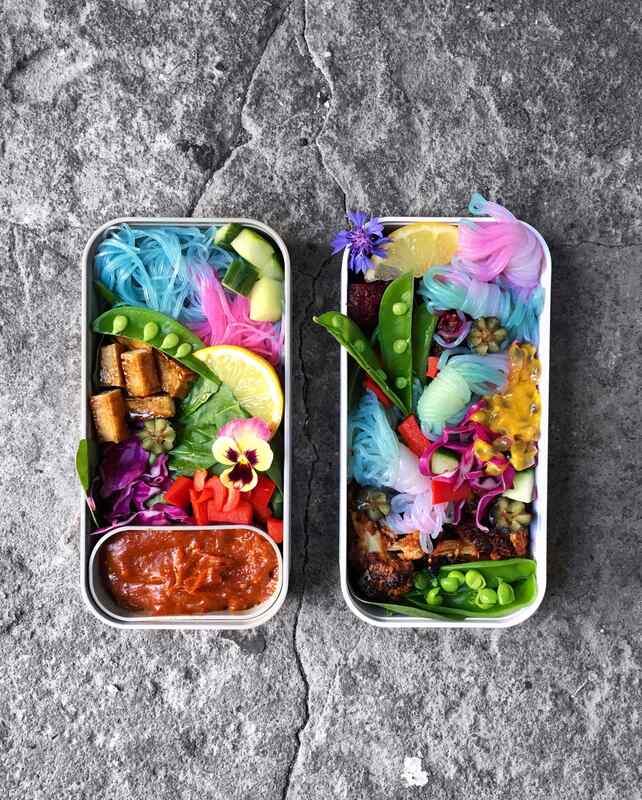 And for more inspiration you can always check out Sara’s Instagram account by clicking here as she is a bento extraordinaire. This bento features some leftovers that I had lying around from the day before like chickpea curry and some roasted mushrooms. To this I added some steamed broccoli, Unicorn Noodles, avocado, baby corn, greens, bell pepper, purple cabbage, nasturtium flower and a satay sauce. 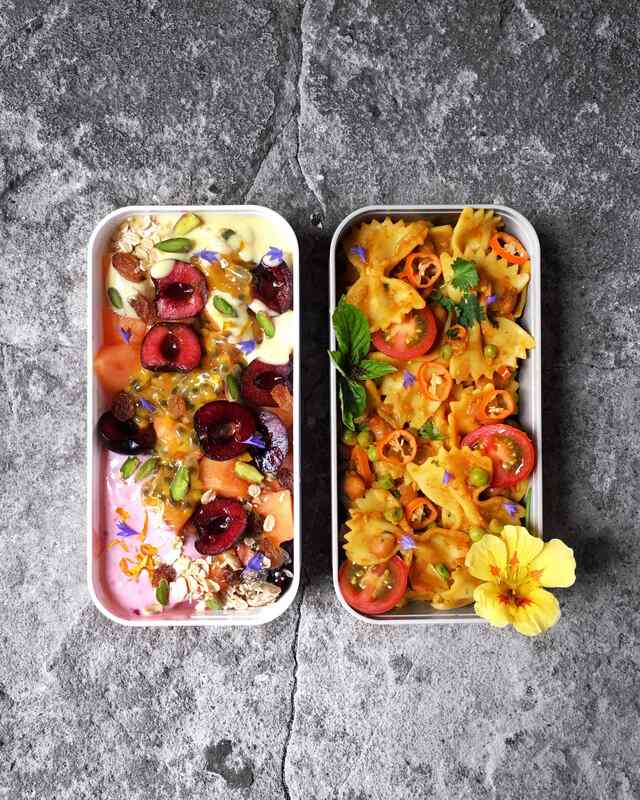 This bento features one of my favourite pasta recipes, being the curry pasta with some beans, cilantro, cinnamon basil, tomatoes and nasturtium flowers and a sweet bento with some vegan yoghurts and fruits. I brought this bento with me to the park to share with a friend, this way we could choose if we’d go for sweet or something savoury. We ended up eating both. 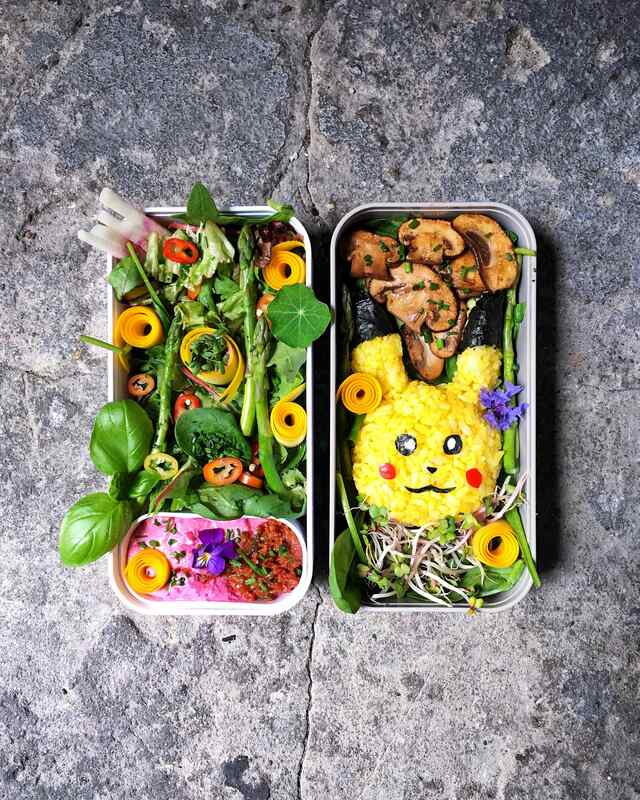 This bento is a bit special as it’s featuring my old friend pikachu, This little rice ball went great with the greens, (vegan) chicken seasoning cooked mushrooms and the hot sauce/beet hummus combination to add some flavour and heat. The greens include spinach, sprouts, nasturtium leaves, green asparagus, yellow zucchini, mixed lettuce, chives, chioggia beet and hot peppers. Basically just go through your fridge and see what kind of greens you could add, you can play around with the ingredients to fit your taste. Another box featuring the Unicorn Noodles I mentioned earlier, they are versatile and go well with veggies and my favorite satay sauce. 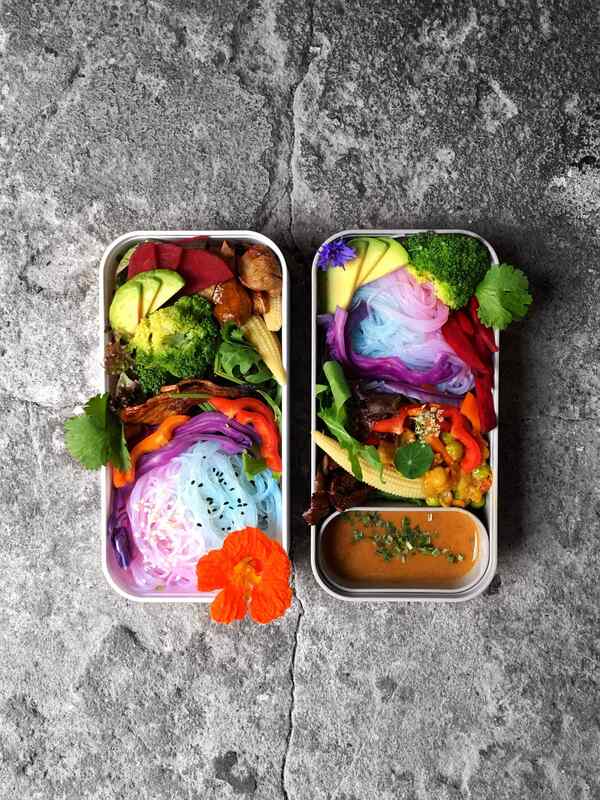 This box also features one of my all time favorite recipes, the miso roasted cauliflower bites which are pure umami bombs, I added some sugar snaps, fruits for some sweetness, tofu panfried with some sweet soy sauce, roasted beets, purple cabbage, bell pepper and of course satay sauce. 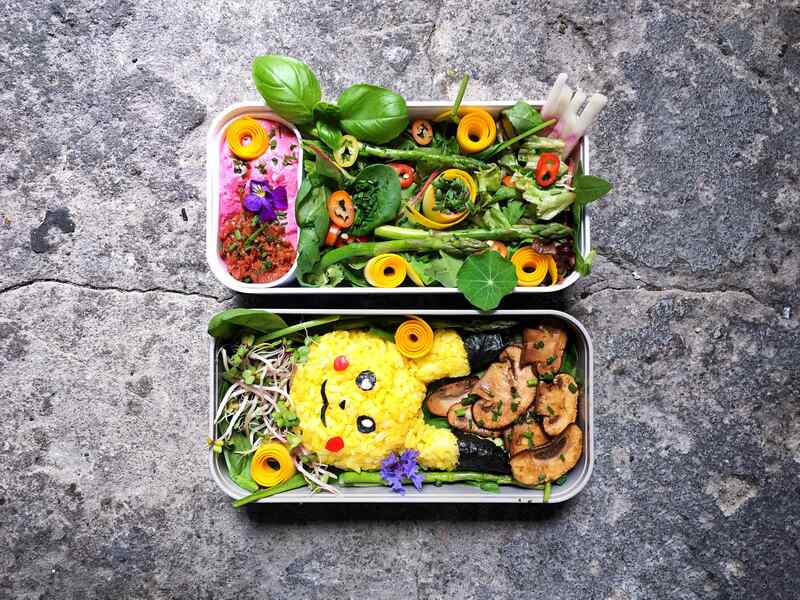 A great bento for any occasion if you’d ask me, yes I like savoury breakfasts! If you’re like me then you love curries, and not only because they’re so incredibly tasty but also because they make awesome leftovers. I had two friends over for dinner so I made two different curries, the beet coconut curry (which will rock your world) and a surinamese curry that fills my nostalgic heart with bliss. I added some edible flowers, because I’m extra like that, steamed broccoli, smoked tofu, leftover rice, peppers and leftover bbq cauliflower bites. This bento is for whoever is in some need of some comfort food, pure comforting food at it’s best! 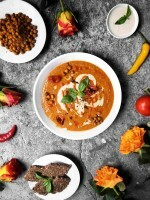 I hope this post could give you some fun and meal ideas and I’ll be sure to make some more meal inspiration posts in the future to show that vegan food doesn’t have to be boring! The recipes featured in the bento can be found on my blog by pressing the titles, they are really really tasty! 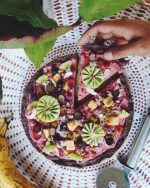 Also follow me on Instagram for more food inspiration and you can also find me on Facebook! Bao Of The Month: Shadow Bao – Halloween Addition.